Summer’s here! 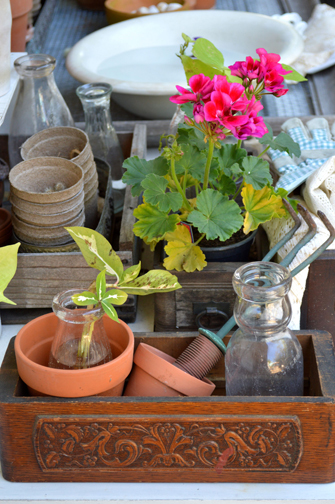 Time to hit the road and hunt for these 10 hot flea market finds to infuse your garden with summer style. A rusty old birdbath becomes a tall perch for a full bunch of gerbera daisies. This old metal wire stand is a lovely place to hang outdoor linens. Dishware: Chipped china and ironstone make the perfect saucers for potted plants; $0.50 cents to $10. Bottles: Old bottles serve as vases for flowers and cuttings; $1 to $5. 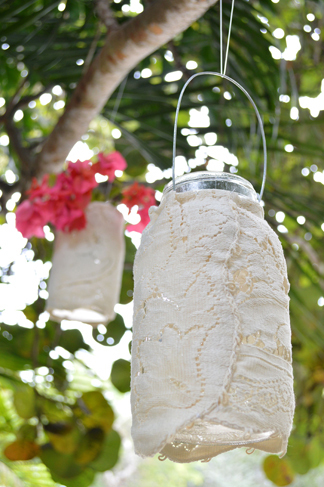 Create simple yet charming lanterns for the garden with a few pieces of lace, old canning jars and wire. Drawers: Sewing machine drawers can be used to organize plant markers, twine and scissors; about $10. Linens: Old stained or tattered linens can be repurposed; $0.25 to $3. Bits of lace come in handy throughout the garden. 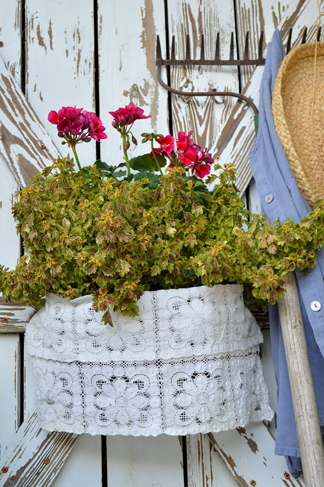 Simply wrap a small section around a potted or hanging plant for a subtle hint of romance. Unusual furnishings: Birdbaths, bookshelves and retail store display pieces make wonderful plant stands; about $20. 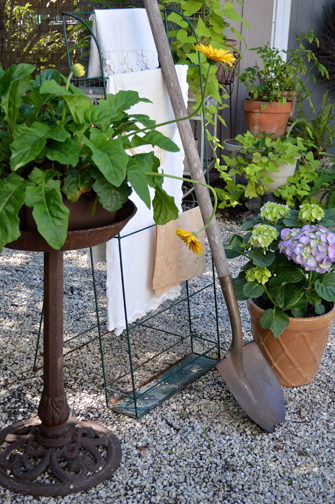 Old garden tools: Metal rakes can become hooks for garden utensils and aprons; $1 to $10. Old sewing machine drawers corral utensils and garden cuttings in a clever manner. Cabinets: Discarded kitchen and bathroom cabinetry can be salvaged and refinished for garden storage; $5 and up. Small architectural salvage: Spindle and newel posts serve as unexpected works of art; $5 and up. A discarded retail store display piece was rescued from a dumpster to create this plant tower. A few pieces of tattered lace and crochet soften the harsh lines and provide the perfect finishing touches. Large architectural salvage: Old doors and windows can be fashioned into tabletops and dividers; $10 and up. 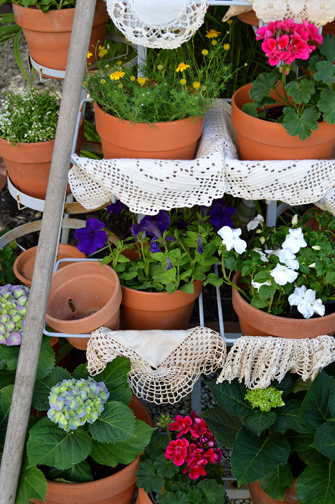 Planters: Anything goes when it comes to container gardening—terracotta pots, galvanized buckets, cement urns, pottery, even seashells; $0.25 to $5. At the end of a long day playing in the mud, it is nice to have a place to wash away the garden grit. 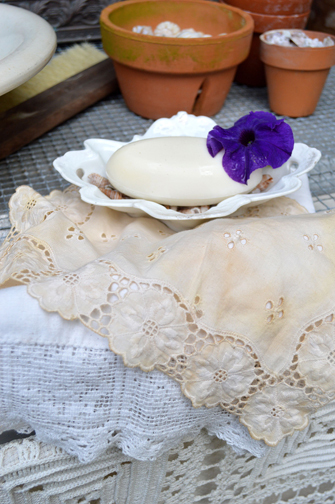 Pamper yourself by providing an outdoor wash area, complete with rich garden soap, a fresh bowl of water and a vintage towel. A garden conjures thoughts and feelings of romance. For poets, artists and scientists, these magical green spaces have been an inspiration and refuge; for vintage décor enthusiasts like us, they are another space to decorate with favorite flea market finds. Happy summer! Written, styled and photographed by Melinda Graham, who owns and operates Surroundings by Melinda, an interior design studio and home decor shop that specializes in vintage style and flea market finds. This entry was posted in Hot Collectibles and tagged Collectibles, flea market finds, hot collectibles, top collectibles, vintage collectibles, vintage finds, vintage garden, vintage style, vintage summer, vintage summer style by Flea Market Decor. Bookmark the permalink.